In the summer, my blow dryer takes a long hiatus. It’s usually either too hot or too humid for me to justify actually doing my hair. I’ve also been blessed with crazy fine hair that has little to no body on its own. If I want to wear it down, I need a little help from some styling products. Have you ever noticed how awesome your hair looks after swimming in the ocean and letting your hair dry in the breeze? I’ve always been amazed at how good my hair looks at the beach even when doing absolutely nothing to it. I’ve also been seeing a lot of sea sprays on the market this summer so I thought would make my own with the hope of recreating that elusive texture only the ocean can give. It took just a couple of ingredients and all of 5 minutes to make. Simply take 1 cup of very warm water and stir in 3 tbsp sea salt, 1/2 tbsp conditioner and 1 tbsp hair gel of your choice. Using sea salt is important to get the desired texture so don’t be tempted by that cute little girl with the yellow dress and umbrella in your pantry. Also, make sure you stir until all of the salt is dissolved. Allow to cool to room temperature and then pour it into a squirt bottle. I am very pleased with the texture this adds to my hair. I usually use it on the second day after washing my hair. I start with my hair dry and squirt it generously with the sea spray. I then scrunch my hair to add some body and allow it to air dry. You could also wrap your hair around a large barrel curling iron to get more defined curl. 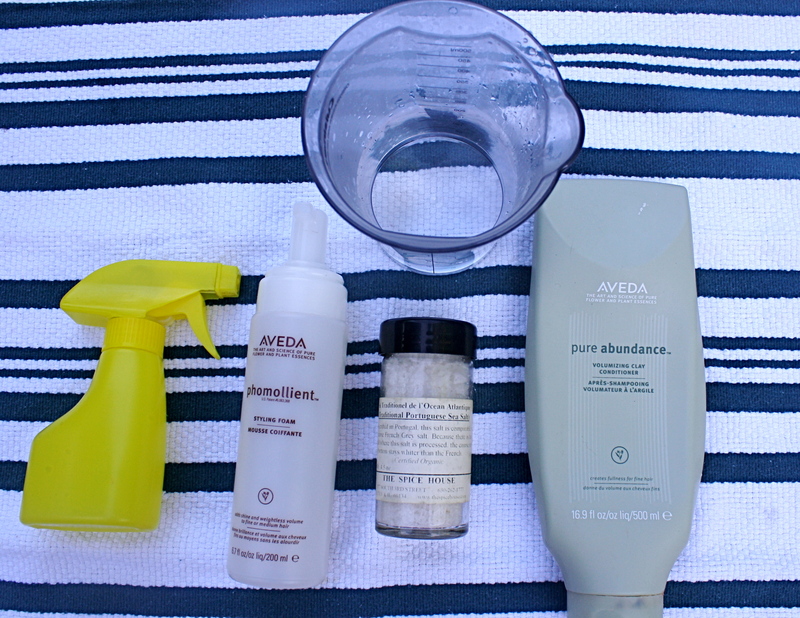 Summer hairstyling could not be easier! 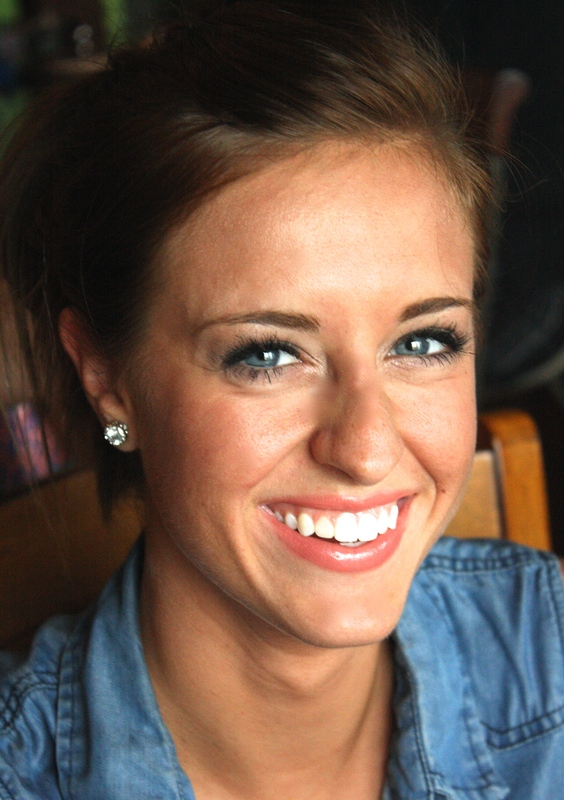 Today we are talking makeup… and how summertime makes it a dripping, streaky, creasing mess. Eye makeup in particular can look pretty gross by the end of the day. Usually I don’t really bother with things like primer, but sometimes (i.e. things like my two siblings’ weddings this summer) I need some extra staying power. I used to use the free samples of Urban Decay Primer Potion I would get from Ulta or Sephora for those special days, but when I started making the switch to more natural and organic beauty products, I realized the stuff was full of junk (like cancer causing parabens and skin irritating bismuth oxychloride). Bummer, because the stuff really works! 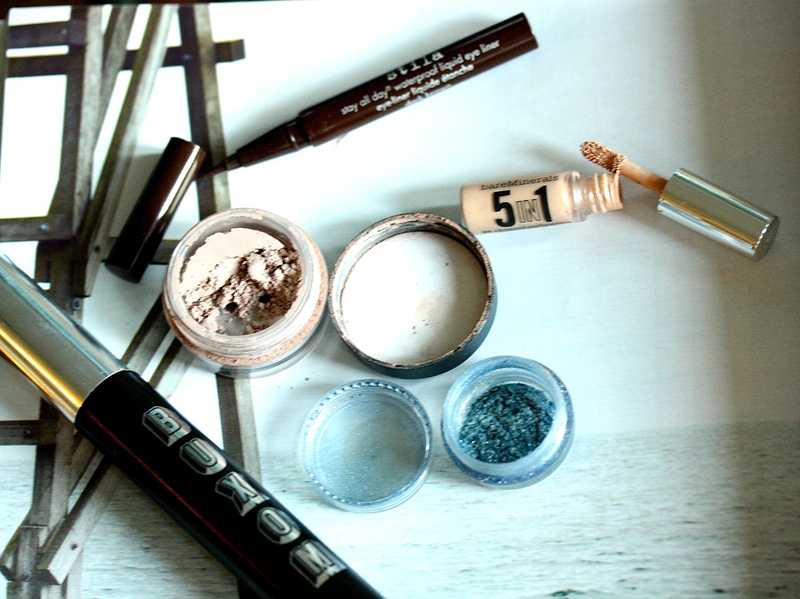 Finding a natural replacement has been somewhat of a letdown so when I found this recipe for a DIY eye shadow primer, I was excited to try it. The best part is that it whips up in seconds and is made from stuff you probably have around your house. 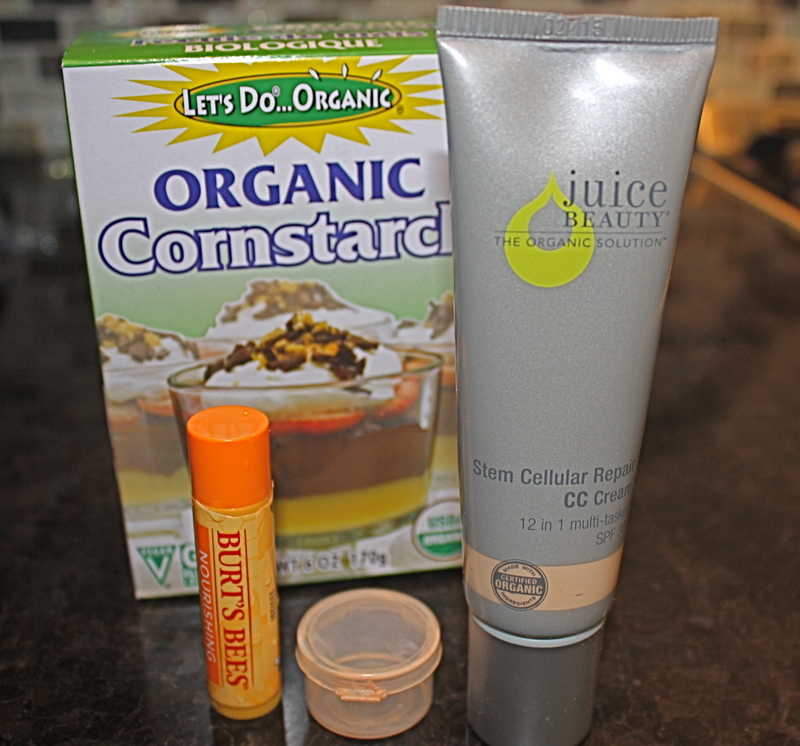 Rummage through your purse to find that tube of Burt’s Bees Lip Balm you have buried in the bottom of it (make sure it’s not the minty kind as this could cause some major eyelid irritation). Next, snag the cornstarch from your baking cupboard and then head to your makeup bag and grab your favorite foundation or tinted moisturizer. 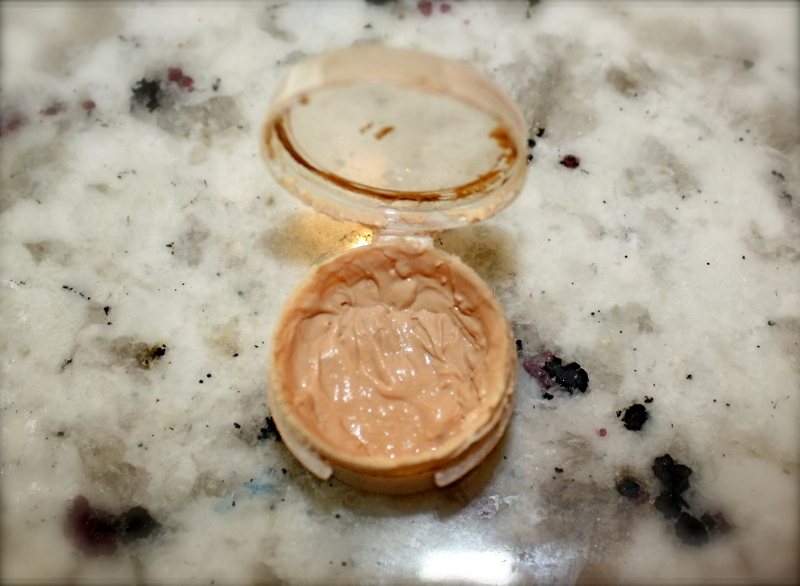 You will also need a small container to mix and store your primer in. Now, of coarse the real question is: does it really work? Well, I put it to the test on three separate days and also paired it up against the competition to see how it would perform. 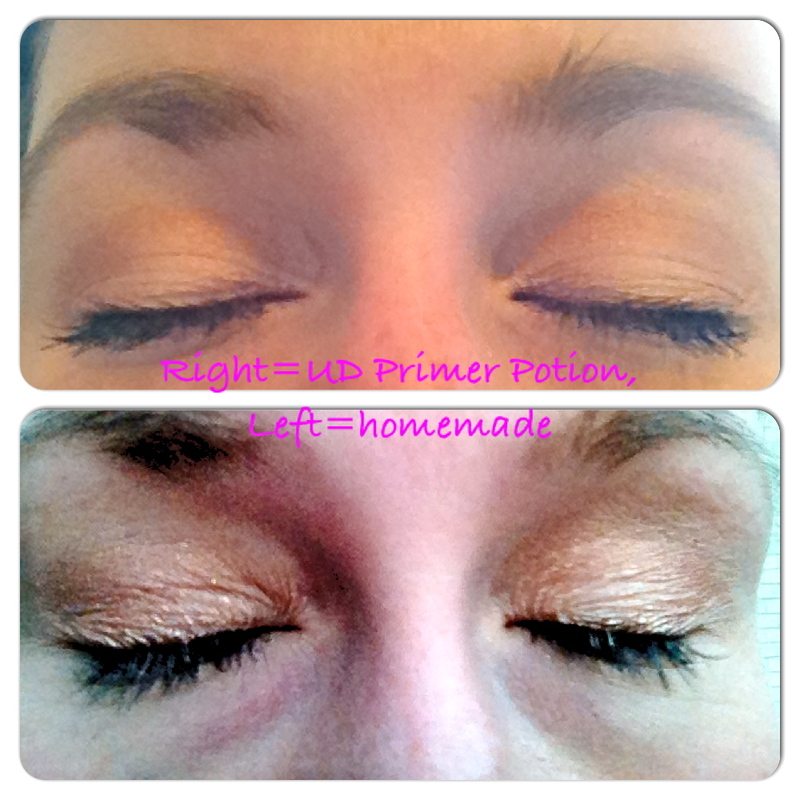 The key is to apply a very thin layer, especially on the crease. The first day I paired it against a left over sample of Urban Decay Primer Potion I had. The first thing I noticed is that both intensified my eye shadow colors equally well. UD looked the best at the end of the day, but my homemade primer wasn’t too far behind. The top photo is at the beginning of the day and the bottom is about 12 hours later. 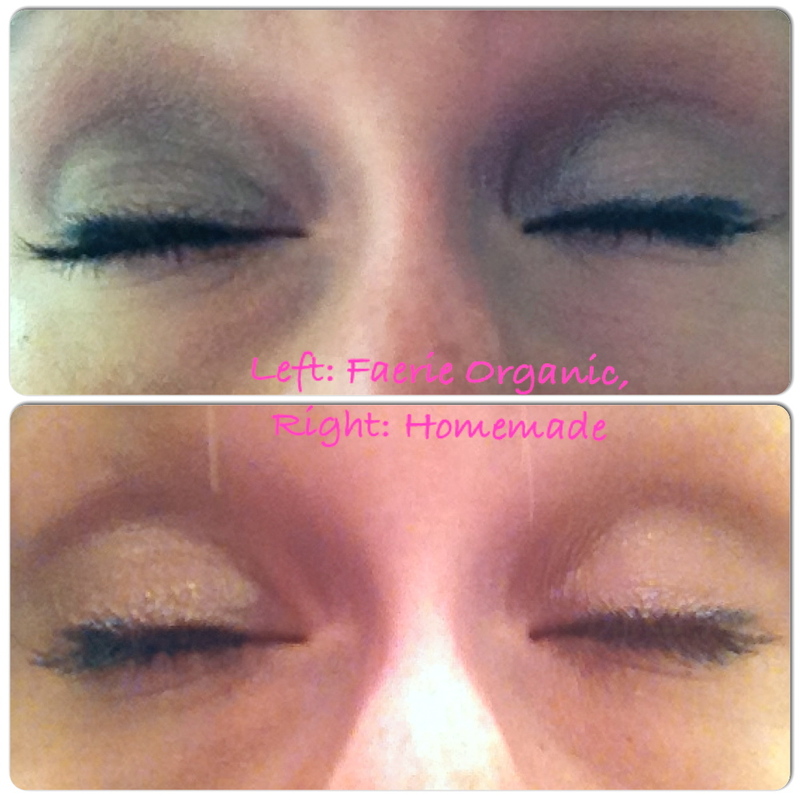 The second day I tested it out against an organic eye primer I bought awhile back from Faerie Organics. Again, both primers did a great job at intensifying my eyeshadow, and both looked reasonably fresh by the end of the day. Top photo is at the beginning of the day and bottom photo is about 12 hours later. I was feeling pretty encouraged after my first two days of testing, but the weather had been unseasonably cool, so I knew that the real test would be a humid summer day. Yesterday was perfect! I mean, we are talking weather so humid that all you have to do is look outside and you start sweating. 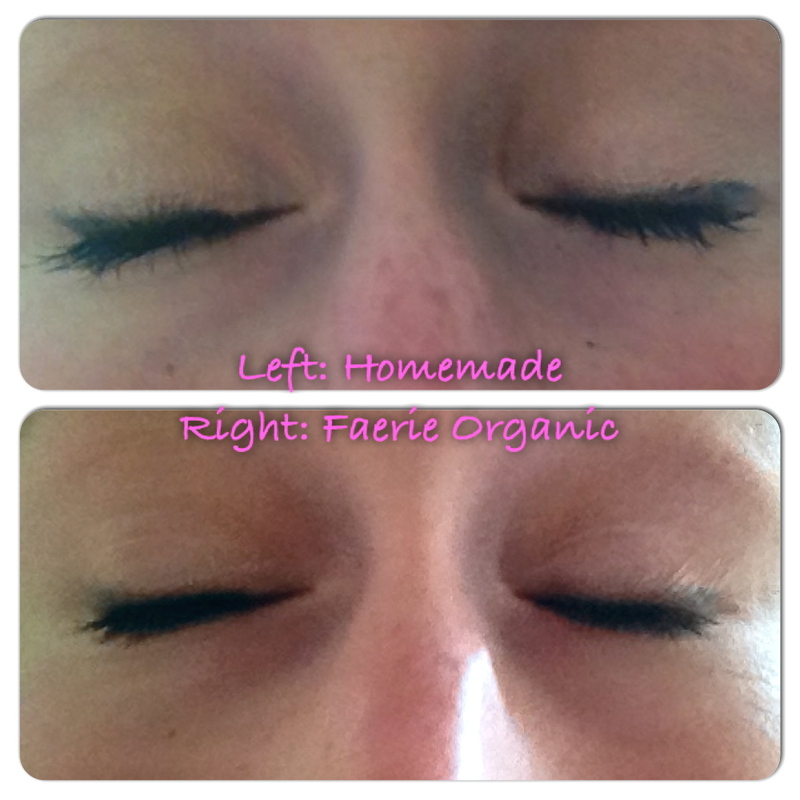 I decided to pair up the homemade primer with my Faerie Organics primer again. At the end of the day, the homemade primer had definitely kept my shadow in place better than Faerie Organics. Both creased some, but the homemade primer creased less. Again, top photo is at the beginning of the day and the bottom photo is about 12 hours later. Final Thoughts: I think this is a great option if you are trying to go for a more natural product or you don’t feel like dropping $20 on something you may not use every day. My lids are not super oily so I would be interested to see how it holds up on someone with oily lids. If there is anything I love as much as playing with food in the kitchen, it’s experimenting with my own beauty products. I love knowing what is in my products and seeing how well common kitchen items double as effective beauty products. 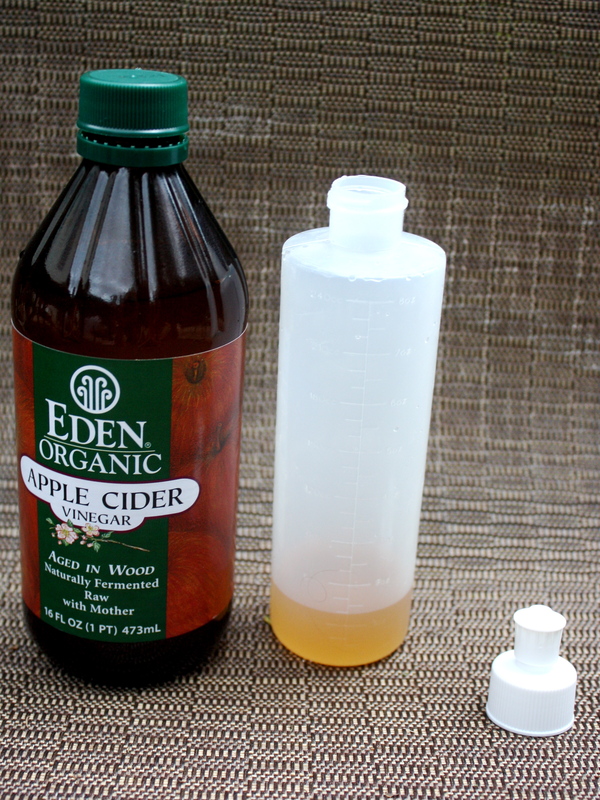 I’ve heard a lot of buzz about using apple cider vinegar as a clarifying hair rinse or in place of conditioner as a way of adding shine and softness to the hair. 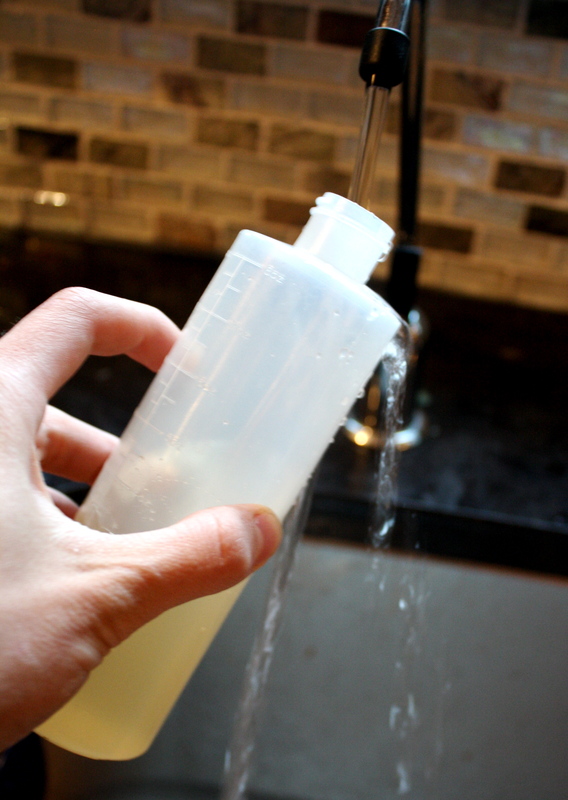 The idea is that the vinegar restores the ph balance to your hair after your shampoo has stripped it away. It seemed too good to be true, but I thought I would give it a try. Start with an 8 oz squirt bottle and some apple cider vinegar. 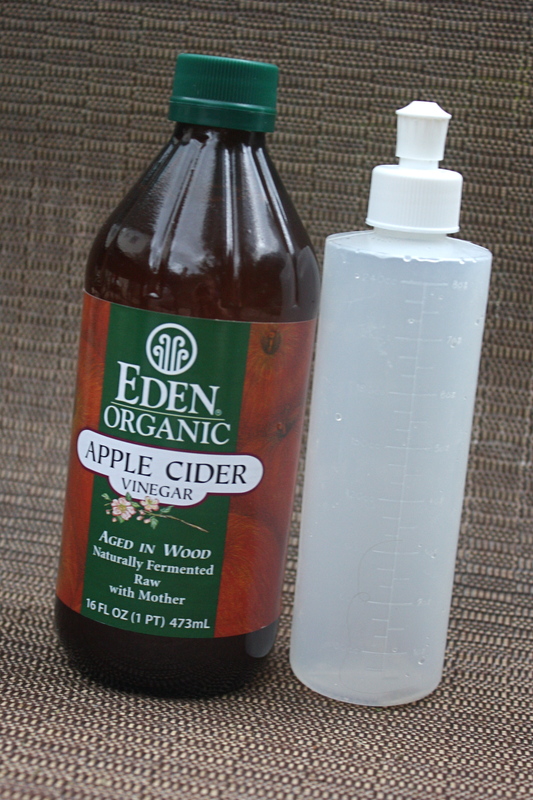 You will get the best results if you use an organic, raw vinegar with the mother still in it. Pour about 1oz of vinegar into the squirt bottle. I have very fine hair so if your hair is coarse and very thick, you might need a bit more vinegar to get the right results. Play around with the proportions until you find what works for you. I think it’s probably a little different for everyone. Lastly, fill the remainder of the bottle with warm water. After shampooing, squirt the entire bottle onto your hair and let it sit for several minutes to soak into your hair. Rinse your hair thoroughly and style as usual. I’m not gonna lie…the smell is less than stellar and you might get a few drops of bitter water in your mouth, but the payoff is worth it to me. The first time I tried it, I was afraid my hair would smell even after it dried, but it didn’t. It actually had a pleasant, sweet apple smell. Try it for yourself and let me know what you think! I had my first child back in 2010 and while I was pregnant, I started looking at the ingredient list on my product bottles and thought, “Uhhh…what is this stuff? Ethyl-para-what?? ?” There had to be something better I could rub into my expanding belly without all these ingredients I couldn’t pronounce. So, I grabbed a bunch of different oils and started experimenting. This recipe has sort of evolved over the last few years and I now have two versions: a body butter (ideal for pregnant bellies or seriously dry skin) and body oil (ideal for the rest of us). Today I’ll share the body oil version, because seriously, you will love it. I think its the perfect blend of nourishing oils that soaks into your skin quickly without leaving a greasy residue. Winter usually leaves my legs looking like some sort of scaly swamp animal, but this stuff really does the trick. I apply it right after I hop out of the shower and the next day my legs are still soft and smooth. It’s also a great shaving oil and eye make-up remover. I’m pretty sure you need to try this for yourself! a few drops of vitamin e oil (optional, but great as a natural preservative). 10-15 drops of an essential oil of your choosing (optional– I usually opt for the unscented version). Melt coconut oil and plant butter in a double boiler. Mix in the rest of the ingredients and pour into an 8 oz container.